The long journey of the Roman legion(s) lost at Carrhae, a distance of over 3,000 miles (5,000 kilometers) and nearly 5,000 miles from Rome itself. A great many modern historians absolutely dismiss the story of the legionaries in China as more of a fairytale than truth, though some prominent historians still argue that this sequence of events is quite possible and even the most probable of theories. Just because it is a hard to believe tale does not at all make it untrue. In every reference from the Asian sources the foreigners appear to be none other than the 10,000 legionaries captured at Carrhae. 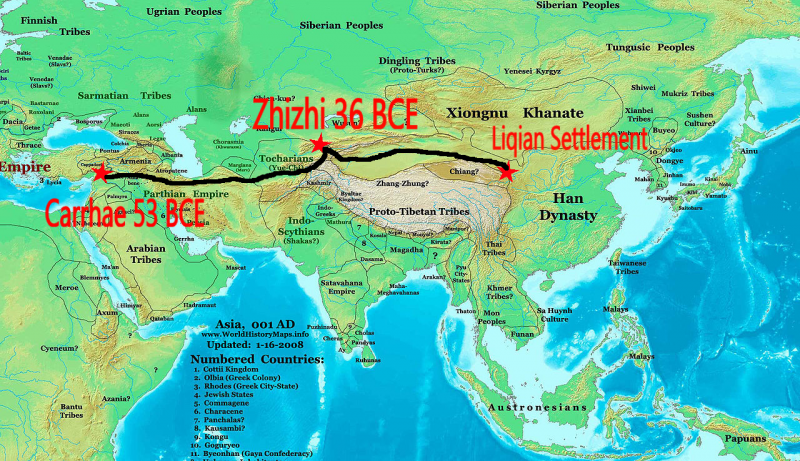 The only gap in knowledge is that the Romans transferred from Parthian control to Mongol control as the Mongols held the town at the battle of Zhizhi. It seems that either the Romans were captured and transported again, or more likely that they were sold as mercenaries. 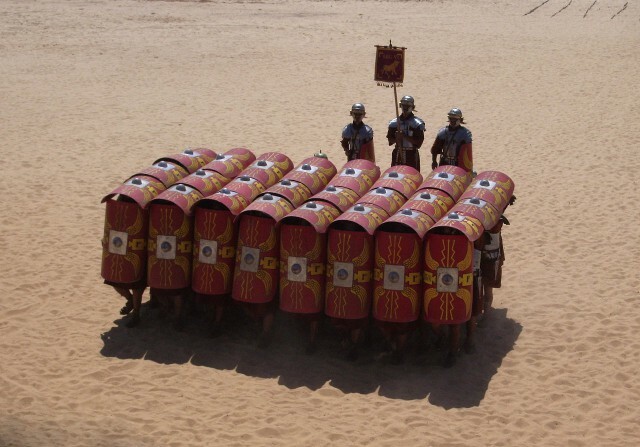 Their “fish scale” formation at the battle is almost certainly the well-known Testudo formation, and the professional practice points to seasoned soldiers. These Romans would have had just each other for company through these many years so it’s understandable to think they had outstanding discipline and kept up their training, which would lead to them having such an impressive showing at Zhizhi that the Chinese used them to guard their own territory. The modern descendants of the Romans are decent evidence of the Roman’s presence but two other theories are possible. The town of Liqian was near the multicultural Silk Road, therefore the Caucasian DNA could be from travelers along the road. The other possibility is that the soldiers at the battle and settlers of the Chinese town were actually descendants of Alexander the Great’s army, though this seems even more unlikely as the events are multiple generations removed from Alexander’s campaigns and the army at Zhizhi was clearly fighting in a professional and western way. The only remaining evidence needed to authenticate the story would be Roman coins or other artifacts at Liqian. If the story is true, it is an amazing story of tragic loss followed by strict adherence to professional soldiery. By the time they settled in Liqian these soldiers would be in their forties and fifties and looking forward to retirement. Based off of the DNA of their descendants it does seem like they weren’t subject to many Tibetan raids, or perhaps they were put to the test again and finally held their own ground.